I've got love like a river in my soul. I've got joy like a river in my soul. The first three items of the “fruit of the Spirit” (Galatians 5:22) are love, joy, and peace. This spiritual compares the peace of God to a placidly flowing river, the joy of Christ to a merrily bubbling fountain, and the love of God to a deep, wide ocean. This song is an African-American spiritual, but the time and place of origin are unknown. It is a song of declaration using water as a simile to describe the qualities of peace, joy, and love in three stanzas. 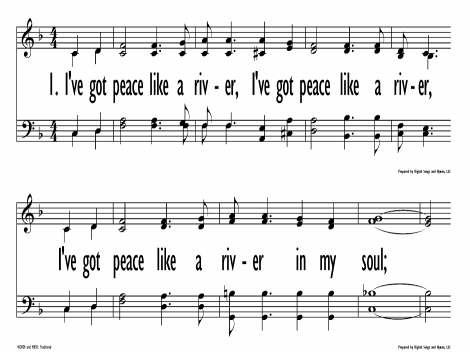 The image of the first stanza, “peace like a river,” may have come from Isaiah 66:12, where a similar picture is used. 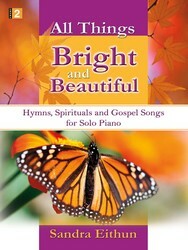 The tune of this African-American spiritual developed with the text. It is a repeated tune; the first half ends on the dominant, and the second half is identical except that it ends on the tonic. The rhythm should be sung with feeling, not rigidly straight. This song is suitable for all ages, and can be easily learned. It may be sung as a song of response after a time of thanksgiving or a declaration of God’s goodness. If it is sung, a simple arrangement should be used, such as “Peace Like a River,” a choral arrangement with guitar accompaniment. If an instrumental version is desired, try involving the children and youth in a handbell or handchime choir with an easy setting like “Peace Like a River” with a C instrument.